Bicyclists are always at risk when they are in close proximity to motor vehicles. When a bicyclist is involved in a collision, it is usually the result of a driver’s inattention or possibly even purposeful failure to yield the right of way to a cyclist. Unfortunately. our attorneys see serious bicycle accidents happen far too often. And with more and more people choosing to ride a bicycle for work or pleasure, there are no signs of these collisions slowing down. There are several different types of bicycle accidents, including right hook and right cross collisions. A right cross bike accident is when a car pulls out of a side street or driveway to the bicyclist’s right. A motorist will either strike the bicyclist as it is crossing in front, or will pull out far enough at the last second to block a cyclist’s path. These type of accidents often result in a bicyclist hitting the hood or bumper of a vehicle. 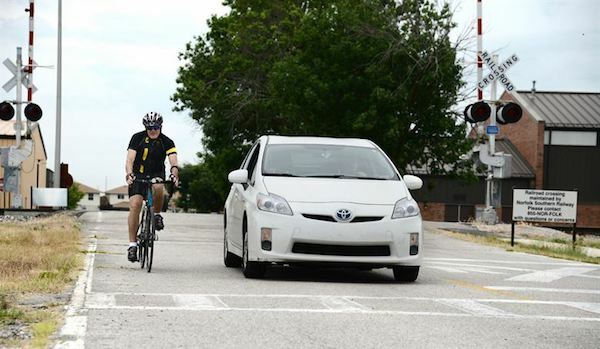 Cyclists can do their part to avoid these collisions by being more visible, as well as anticipate cars pulling out from driveways and parking lots to their right. Additionally, cyclists may want to ride farther to the left to make themselves more visible. A bicyclist in a “right cross” situation is the same as a car, meaning the motorist exiting a street must yield the right of way to flowing traffic. A right hook accident is when a bicyclist is in front of a cross street and is struck because a motorist fails to see the bicyclist when making a right-hand turn. A more common scenario is when a motorist overtakes a bicyclist, then cuts them off when making a right turn. In most cases, a car will pass a bicyclist and then forget about them or assume they have passed with sufficient space. Then, when making a right-hand turn, the bicyclist slams into the right-hand side of the vehicle. The collision is called a “right hook” because the car is swinging to the right. Bicyclists can avoid this by trying to ride farther into the road so that motorists have to make a deliberate pass. Then, even if the bicyclist is cut off they are farther to the left when trying to swerve. 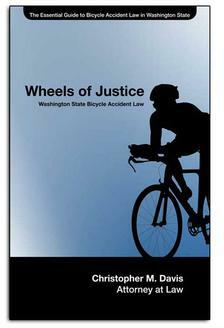 Seattle and Washington state bicyclists who have been injured or families who have lost loved ones because they were hit by a truck, car or motorcycle have every right to seek justice for the harm they have suffered. At Davis Law Group, P.S., our attorneys can help as you face medical expenses, personal property damage, lost wages and more, including pain and suffering because of a serious bicycle accident. Davis Law Group handles cases from across Washington state. We offer free case evaluations to help victims and their families learn more about their legal options. If you choose to hire us, you don’t pay anything unless we win your case.